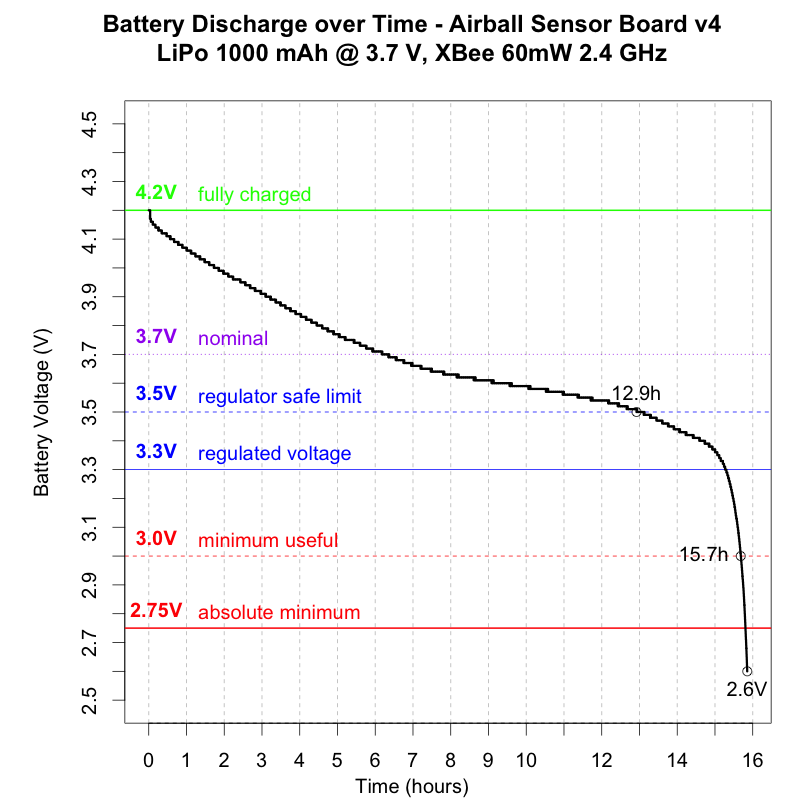 I've been hard at work on several aspects of Airball's air data sensor probe as well as the in-cockpit display unit. I recently received circuit boards for version 4 of the sensor probe. This new board fixes a lot of things, and adds several new bits of functionality... which I'll cover in another post. One of the things it adds, though, is a battery monitor chip (the Maxim DS2782), so we can now monitor the probe's battery status in real time. The total useful runtime from a full charge. I had some ideas about what it ought to be, but I wanted to confirm that the math is not too far off base. 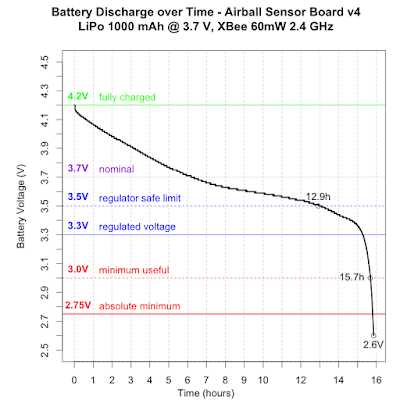 How the probe behaves as the battery voltage drops. Whether the probe will safely cut off at any point, or just keep running and potentially damage the battery. Whether the battery monitor chip is working and sane. The runtime was actually longer than expected (we expected ~7.5h, but ran for about double that). The battery discharge rates (in both mA and mW) we saw aligned reasonably well with our predictions, but the battery capacity seemed to be much higher. I am not sure whether that is due to the battery cell having a higher capacity than advertised (maybe?! ), or some other problem with the test setup, but more validation is needed. Neither the battery itself nor any other component cut off the module at a safe low voltage level. (The battery should have a low voltage cutoff at 2.75V, but despite allowing it to discharge to 2.6V, it never cut off...) I will add some additional protection mechanisms (both software and hardware) to avoid over-discharge of the cell. More to come soon about these air data probe improvements, and some brand new design work on the display unit!